The Problem when create Windows 10 Installations DVD for another PC and you use the MS Media Creation Tool to download and create a ISO file, it is in most cases the HD space! If you want to create an ISO file with the Microsoft Media Creation Tool you need 10 GB on the Hard Disk. 4.5 for Download and 4.5 for the ISO File and 1 GB Extra. ► ... Hibernation settings windows 10 (turn off, enable)! ► ... Use Disk Cleanup in Windows 10 for unnecessary files, how to! ► ... Customize the pagefile.sys in Windows 10 (paging file)! 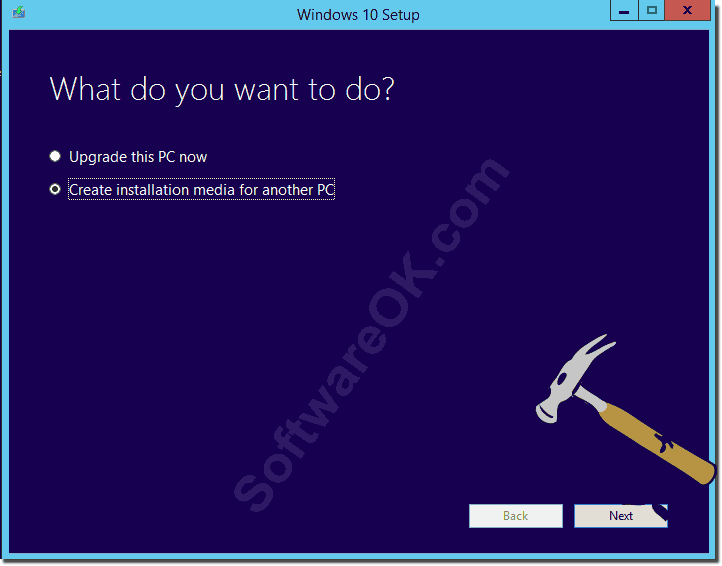 (Image-1) Windows 10 Installations DVD hangs 99! The operating system Windows 10 is the best and most modern system from Microsoft. The number of users around the world is just outside the scale. Several billions of people are growing every day using Windows. Such indicators have not been achieved by any other company. The developers have perfected the system and brought it to the highest level, relying in many ways on the needs of the users themselves. However, this problem can occur when creating the Instalations DVD for Windows 10 without a correct error message from the system. Such as. "You have not enough hard disk space"!